We can replace your worn out or torn slide out awning fabric without replacing the hardware. We use heavy duty triple laminated white vinyl fabric which exceeds original fabric weight and comes with a 30 month manufacture's warranty. Fabric handles slide outs with up to 42"
projection (47.5 bead to bead distance). 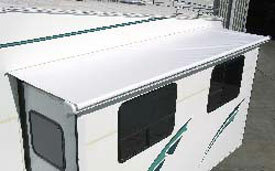 Our kit comes with interchangeable polyethylene beading to fit either size roller tube slot and 1/4" bead installed in the awning rail end, most slide out awnings have either a 5/32" or 3/16" slot. If we will be shipping your order to Alaska, Hawaii, or Canada we must assess a shipping charge of $40. Please add this extra charge to your cart prior to checking out so that we can cover our costs.